Nosey cup, leg lift, mail alert, step stool, kitchen gadgets, and other miscellaneous items for people with dexterity issues. Measures a BIG 4.9 in. x 3.3 in. 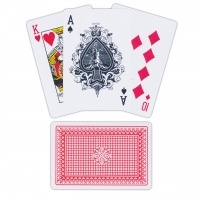 These Jumbo Playing Cards are easy to hold and easy to see Made especially for those with low vision or dexterity issues. Play all your favorite card games with ease. Cards measure 4.9 in. x 3.3 in. The Mail Chime tells you when your mail has arrived. No more wasted trips to the mailbox in cold and wet weather. 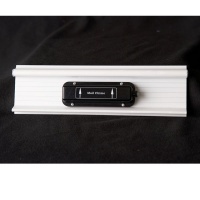 Simply mount the sensor on your mailbox door using double face tape (included) and plug the receiver into an electrical outlet anywhere in your home. When the mailbox door is opened, the sensor on the mailbox door sends a wireless signal to the Mail Chime in your home. The Mail Chime then alerts you by flashing a bright red LED light and four beeps that your mail has been delivered. It's the perfect solution for the Deaf, hard-of-hearing, the blind, low vision, individuals who find it difficult to walk, pregnant women, the elderly or people who are just plain busy. An adjustable volume control lets you customize the sound to a comfortable level to meet your unique situation. Comes with Mail Chime Receiver with AC adapter, sensor with 12-volt A23 battery, double-faced tape and instructions. Mail Chime measures 3-1/2 in. wide by 1-5/8 in. high. Receiver measures 1 in. high by 4-1/8 in. wide by 3-3/8 in. deep. 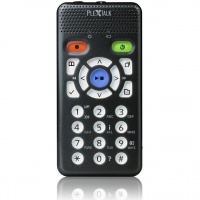 The PLEXTALK Pocket is a DAISY-compliant digital book player, MP3 music player and voice recorder all in one compact lightweight unit that you can easily slip into your pocket and take anywhere It great for work, school or leisure and offers unsurpassed accessibility for those with low vision or learning difficulties. Play back DAISY audio books and text-based DAISY books, NLS Library of Congress books and MP3 music files. The PLEXTALK Pocket supports up to 32GB of files on removable SD cards. You can also upload files to, and download from your PC. Record short voice memos or longer meetings and classes, and even insert headings at the touch of a button while recording for fast, easy navigation during playback. Listen to your books, music and voice recordings on your choice of the powerful built-in speaker, or you may prefer the included stereo earphone for private listening. The PLEXTALK Pocket gives spoken information about the current operation and provides key descriptions in Key Describer mode. In addition, it speaks menu items and includes a help function by simply pressing the Number 5 key. - With PLEXTALK Pocket in your chest pocket or bag pocket, you can enjoy listening to digital talking books and play your favorite music. Simply press a button to insert a heading while recording a long conference or class, and you can playback only what you want to review by navigating by headings. Record short voice memos - great for remembering telephone numbers, appointments, To Do's, etc. - You just put more capacity of SD card to carry as many books and music you have as possible. PLEXTALK Pocket supports 32GB SDHC. 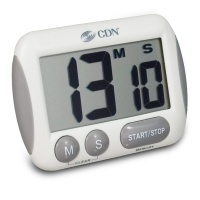 - Sleep timer function that switches off the unit at the user-set amount of time. - Connect to Windows PC (Win 2000, XP or Vista) by bundled USB cables and PLEXTALK Pocket becomes an external drive. You just drag-and-drop files on your PC to PLEXTALK Pocket, without any specific folder name rules. Now you are ready to go out with your favorite DAISY books, other digital talking books, music, text, html. - PLEXTALK Pocket plays books from services including Bookshare.org, Recording for the Blind and Dyslexic (RFBandD). The NLS (National Library Service for the Blind and Physically Handicapped) also makes materials available at no charge. Please contact these providers directly for further information about available materials. - If you have our product PTR1 or PTR2, you can copy the contents on CD from either of them to PLEXTALK Pocket without PC. Just connect the devices by USB cables, then press one button to back up the files on CD to the SD card in PLEXTALK Pocket. MEDIA: Support for removable 32GB SD cards and USB flash memory You can expand the capacity of storage up to 32 GB SD card. Media Transfer from USB without PC You can back up the contents in external USB media connected to the USB port. POWER: Battery Rechargeable via AC Adapter and USBA replaceable lithium polymer battery designed for PLEXTALK Pocket supplies power up to 10 hours for playback or recording. The battery is fully recharged via the bundled AC adapter in about 4 hours. Sleep Timer Quickly press and release the Power key once to set 30 minutes for sleep timer. The sleep timer setting will increase by 30 minutes for each press, up to a maximum of 2 hours. 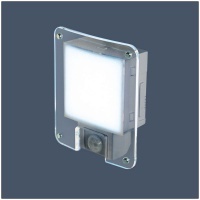 The energy-efficient Sentina ZenLight LED Motion Sensor Light combines the best of ancient Japanese lighting methods with the latest in LED lighting technology and motion sensor technology. The built-in authentic Japanese Shoji Paper takes the energy-saving LED lights and gives it a soothing and peaceful glow. The built-in motion sensor provides light only when needed, turning on automatically when the consumer enters the room and shutting off when the consumer leaves the room. The sensor can be adjusted to shut off after 1, 5 or 10 minutes. Ideal in-home lighting solution for those with arthritis of the hands, hand pain or dexterity issues, as well as those with limited hand function. 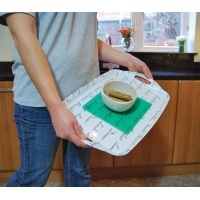 Tenura Extreme Non-Slip Tray Liner Mat - Translucent Green - securely hold plates, bowls, and cups in areas prone to movement, jolting, or tipping. Once applied to a surface, it will hold until you decide to remove it, which can either be done by gently pulling from the edge, or use a little water, and the material will leave no residue. Note: Do not use when wet because getting the mat wet removes the anti-slip and grip properties, but once dry, they are restored. 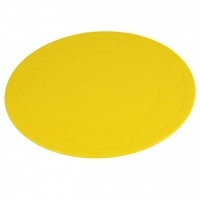 Tenura Non-Slip Coaster - Yellow - helps prevent cups and glasses from sliding on tables, trays, and counter tops. 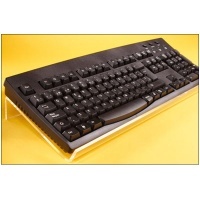 The Viziflex Angled Keyboard Stand was designed to hold your computer's keyboard at the ideal angle for easier, more convenient viewing and typing. Fits all standard keyboards including Big Keys. Made of clear sturdy plastic. Size: 17" wide x 6" deep. Weight: 1 lb. Note: Stand only. Purchase keyboard separately.